by richardelliott	Posted in	Skin	on 11/04/2019 . Today, we’re taking an in-depth look at one of the brands we stock here at Skinstation: MZ Skincare. MZ Skincare products are a luxurious collection of skincare products created by Dr Maryam Zamani. This high-performance doctor-led brand is backed by impressive clinical trials and boasts highly coveted awards. Using pioneering ingredients and actives, these incredible skincare products address the key causes of ageing to deliver youthful, glowing skin. MZ is performance driven and achieves its superb results by delivering on the three pillars of the brand’s anti-ageing ethos: Reveal, Enhance and Protect. These principles are at the very heart of everything MZ does. Reveal – These products focus on proper cleansing and exfoliation of the skin. They gently remove dead cells to prepare a clean, fresh canvas for the application and absorption of serums and concentrates to give a clear, glowing complexion. Enhance – These products include the application of ingredients like >hyaluronic acid, retinol peptides and vitamins to hydrate and plump the skin. This encourages the formation of collagen to refine and diminish the signs of pigmentation for an even complexion. Protect – These products work to strengthen the lipid barrier whilst defending the skin from external stressors, such as UV rays and free radicals, which can cause damage and premature ageing. This includes the application of powerful anti-oxidants such as vitamin C, SPF’s and stem cell actives. This three-step process contains all the principles and products needed to address the key causes of ageing. Dr Maryam’s products balance proven anti-ageing ingredients and cutting-edge scientific techniques to ensure you have everything you need for a glowing, youthful complexion. MZ Skin founder, Dr Maryam Zamani, is a renowned London based Oculoplastic surgeon and aesthetic physician with a background in dermatology. With a global reputation for excellence in eye and facial aesthetics, she prides herself on delivering the most natural-looking results in the field of skincare. Dr Zamani believes that a beautiful complexion starts with a consistent, daily skincare routine. She takes a less is more approach, with the idea that the right regime with ingredients and formulations that work in synergy together will help to reveal, enhance and protect the skin. She puts her creation of the MZ brand down to the need she saw for a high-performance skincare rooted in medical science, coupled with a beautiful sensory experience. These Hydra-Lift Golden Eye Treatment Mask from MZ Skin are infused with Nano gold particles that deeply penetrate the delicate area around the eyes. The gels are supercharged with collagen, hyaluronic acid and seaweed to improve elasticity, minimise the appearance of fine lines and reduce puffiness. Simply apply under the eye area after cleansing the face and peel off after just 15 minutes for a more bright-eyed, youthful look. The Brighten & Perfect Serum from MZ Skin is a fast acting, ultra-targeted serum which combines the potent complex of actives and an optimal dosage of 10% stabilised vitamin C to address the visible effects of sun damage, skin tone imperfections and premature ageing. The rich formula works to help protect the skin’s elasticity, activate collagen production and create a shield to protect against environmental aggressors. The results are a refined, brightened and restored complexion. 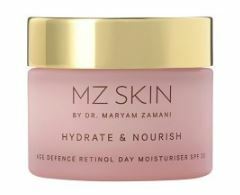 For truly nourished and hydrated skin, MZ Skin’s potent Age Defence Retinol Day Moisturiser is a nourishing moisturiser that works to heal imperfections, refine the complexion and brighten the skin tone. Its added SPF 30 ensures the skin is protected from sun, to prevent the signs of ageing caused by UV rays. It is also infused with antioxidant-rich kahai nut oil to protect and hydrate. Tone and lift with the MZ Skin Germanium Roller. This facial massage tool helps to stimulate and energise the complexion whilst working to temporarily boost skin circulation and radiance. The added acupressure functions of the device allow to gradually press key healing points, which stimulates the body’s natural self-curative abilities. The roller improves fluid and blood circulation to reduce puffiness and even out skin tone. If you have any questions about any of the MZ Skin range of products we stock here at Skinstation, do not hesitate to contact us.